In Veeam Availability Console, you can configure Veeam backup agent global settings for one or more managed computers. At the top of the list, click Settings. Disable scheduled backups — select this option if you do not want to run automatic backups for some period of time. For example, you may want to put backup activities on hold if you plan to perform resource consuming operations on the endpoint at the time when the backup job is scheduled. For details, see Disabling and Enabling Scheduled Backups. Disable Control Panel notifications — select this option if you want to disable Veeam backup agent warning and information messages on the notification bar in the Control Panel. For details, see Disabling Control Panel Notifications. Disable backup over metered connection — select this option if you want to disable backup over metered Internet connection to avoid extra costs. Veeam backup agents can automatically detect metered connections. If this option is enabled, Veeam backup agents will not perform backup when the endpoint is on such connection. For details, see Disabling Backup over Metered Connections. Throttle backup activity when system is busy — select this option if during backup Veeam backup agents must set low priority for its components engaged in the backup process. For details, see Throttling Backup Activities. 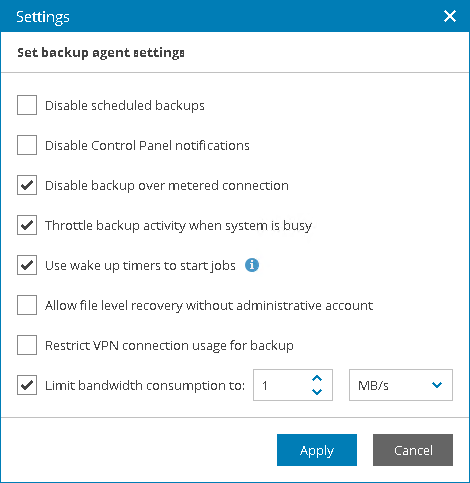 Use wake up timers to start jobs — select this option if Veeam backup agents must automatically wake up a managed computer from sleep at the time when the backup job is scheduled to start. This option is supported for computers running Veeam Agent for Microsoft Windows version 2.2 or later. For details, see Computer Wake Up from Sleep. Require local admin privileges for FLR operation — select this option if you want to disallow to perform file-level restore under an account that does not have administrative privileges on the computer with Veeam backup agent. This option is supported for computers running Veeam Agent for Microsoft Windows version 3.0 or later. For details file-level restore, see Restoring Files and Folders. Restrict VPN connection usage for backup — select this option if you want to disable backup over VPN connections. For details, see Disabling Backup over VPN Connections. Limit bandwidth consumption to — select this option if you want to limit bandwidth consumption for Veeam backup agent jobs and specify the maximum speed for transferring data from Veeam backup agent to the target location. For details, see Limiting Bandwidth Consumption. After you save changes, the specified global settings will be propagated to selected Veeam backup agents.